Introducing our Apprentice of the Month: Ivy! Reason for Becoming an Apprentice: Ivy was interested in STEM, particularly science research and genetics, but she also loves working with kids. 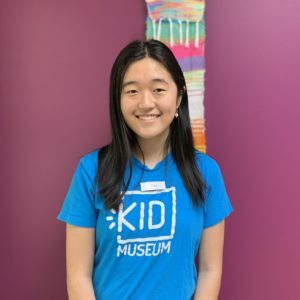 Favorite Part of Being an Apprentice: Ivy says we underestimate kids abilities, and she enjoys seeing the ideas that kids can come up with at KID Museum. Future Plans: Ivy hopes to study Child Development at her top college choice, and ultimately become a Pediatrician.